by Tariq Shadid – September 23, 2011 was a memorable day. On that day, we watched the President of the Palestinian Authority unleash a barrage of strong words against the Zionist colonialist state of Israel, using language and meanings that we had rarely heard him use before on the international diplomatic stage. He mentioned the Nakba, the ethnic cleansing, the racist annexation wall, Israeli state terrorism and settler terrorism. Interrupted by loud roars of applause from the audience of UN representatives, he made mention of Yasser Arafat’s famous ‘olive branch speech’ of 1974. The enthusiastic reception of the speech marked a rare occurrence for Palestinians worldwide, namely to experience a warm avalanche of support for their cause at an international stage full of politicians and diplomats. Abbas did make a mistake by calling the occupation of Palestine the ‘last occupation’, obviously ignoring the occupations of Iraq, Afghanistan and other countries in the world, but this unnecessary faux pas did not affect the overall impact of his speech too much. Then came Netanyahu, and the contrast was as shrill as it must have been embarrassing to all supporters of the Zionist state. Every now and then, there was applause, but it was so soft that one might suspect that Zionist propagandists had forgotten to install microphones to amplify its sound. In a racist statement typical of Zionist leaders, he referred to Palestinians as ‘insatiable crocodiles’, while in fact his whole speech could be typified as a long, boring and meaningless lamentation dramatically riddled with crocodile tears. Zionist rhetoric would of course not be complete without the usual disproportionately high dose of lies, this time even involving the name ‘Netanyahu’. Artificially trying to create a historical connection between himself and the land of Palestine, he referred to a person with that name who was said to have lived in the Middle East a long time ago. What he deliberately omitted to say, was that his real family name is Mileikowsky – check your Wikipedia – and that he, like many Zionists, adopted ancient Jewish names only to create an artificial heritage. Yes indeed, Netanyahu ‘extends his hand’ towards Palestine; as has become blatantly clear to the world despite years of brainwashing and propaganda, that hand is extended not in peace, but in order to steal land, imprison Palestinians, and slap justice in the face. With all this in mind, I must admit that the UN statehood bid speeches made more impact on me than I had expected them to, due to my habit of approaching all diplomatic efforts with a great deal of cynicism. As a Palestinian, recent decades have taught me to scoff at speeches, resolutions, promises, negotiations, diplomacy, and other expressions of Palestinian helplessness. To sum up my dilemma: I had to admit that I heard some great words at the UN, but at the same time, did great words ever end an occupation? As we see the pieces being moved on the chessboard of international politics, what about the people? It would be unwise to take the euphoric demonstrations of support in the streets of Ramallah as representative of overall worldwide Palestinian sentiments towards the issue. For starters, a large proportion – if not a majority – of Palestinians including myself have been highly critical of Abbas’ conduct in his position as leader of the Palestinian Authority in the past years. His handling of tensions with Hamas, his positioning during the war on Gaza, his handling of freedom of speech and expression in the occupied territories, his weak diplomatic maneuvering versus the US-Israeli axis of colonialism, and his relative silence during the construction of the Apartheid wall are only a few examples of issues where many Palestinians feel he fell wildly short of showing courageous, reasonable and representative leadership. One venue where dissenting voices can be heard nowadays, is that of social media like Facebook and Twitter. Widespread concern is prevalent among many Palestinians – not only those living in exile – about the very heart of the Palestinian cause: the Right of Return. Will recognition of a Palestinian state by the international community pose a real threat to this issue? 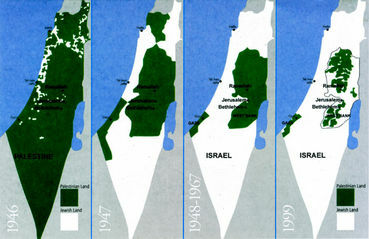 In this respect, the memo of Guy Goodwin-Gill, Oxford University expert of international law, argued that the replacement of the PLO as the legal UN representative of the Palestinian people by a Palestinian state would lead to the legal disenfranchisement of the majority of the Palestinians. In response, many Palestinian organizations both inside of Palestine and in exile adopted critical stances concerning the UN statehood bid, ranging from sharp cynicism to outright opposition and condemnation. There is a widespread suspicion that Mahmoud Abbas considers the Right of Return to be an irrelevant and impractical issue that is merely standing in the way of solutions. In short, whether the Palestinian Authority likes it or not, they have a lot to explain about this issue, and they don’t seem to be putting much effort into it. At this moment, it remains to be seen whether a successful UN Statehood bid would result in anything at all for the Palestinians. Such a scenario is hard to imagine, considering the high probability of a US veto on the issue. Those who have allowed themselves to be gripped by euphoria, and are expecting a Palestinian state to arise from the ashes of Oslo, are quite likely to be faced with heavy disappointment if the US chooses to maintain its traditionally blind pro-Israel stance. Granted, Mahmoud Abbas will probably end up having improved his popularity in the West Bank either way, by daring the military giants of both the Middle East and the opposite side of the Atlantic, whether this state will come into being or not. But what comes after that? No one really knows, and speculations remain exactly what they are: only speculations. Putting all these facts and thoughts together, it remains difficult to decide how to deal with the current state of affairs. Is it wise for Palestinians worldwide to adopt a stance that is as harsh as that of the USPCN (United States Palestinian Communities Network), namely to reject ‘fully and unequivocally the Statehood initiative’? Or at the other end of the spectrum, should Palestinians put their full weight behind Mahmoud Abbas, hoping to help this diplomatic adventure succeed, while disregarding the risks it entails according to Goodwill-Ginn? Considering the fact that this showdown has pitted Mahmood Abbas and his ilk in diametrical opposition to Tel Aviv and Washington, there is an argument to be made to do neither. The Palestinian Authority made a huge mistake with respect to the Israeli atrocities of 2008-2009, when it failed to give its full support to the Palestinians of Gaza. Therefore, we must ponder: is it wise to make a similar mistake in the opposite direction? When Gaza found itself in full confrontation with Israel during that winter war, did the dictates of national unity not require our full support for the people, even though not all might agree with the views and tactics of Hamas vis-à-vis waging resistance against the Zionist state? Sometimes your brother may pick a fight with neighborhood bullies that does not suit you, but is it proper in such a situation to forget your family responsibilities towards him, and leave him to be beaten up? Similarly, if the Abbas we are at serious odds with ventures into the United Nations, and dares Israel and the United States in the diplomatic venue, can we actually afford to put ourselves in any position but beside him, even if not totally behind him? Such principled positioning – where you can only support the Palestinian fights against Israel that you completely believe in – at the end of the day serves to undermine the unity of the Palestinian people. It is difficult enough already to keep the Diaspora together, and to insist on Palestinians remaining united across the ‘borders’ of the West Bank, Gaza, and 1948-occupied Palestine. Even if this unity cannot be achieved in a physical sense, all efforts should be made to maintain it in the sense of collective Palestinian memory, experience, and aspirations. For now, the smartest thing to do seems to be to adopt a policy of wait and see, and to not give the Israelis any opportunity whatsoever to gloat over Palestinian disarray or disunity, let alone to – albeit unwillingly – end up next to them in the camp of anti-Statehood rhetoric. It sometimes seems as if the die-hard Palestinian critics are acting as if they are expecting the Palestinians to actually win the statehood bid. Even if they do, when this diplomatic ‘statehood’ battle is over, regardless of its outcome, can’t PA criticism be brought back in full swing regardless? There is no reason for any of us to accept the potential national treason of discarding the Palestinian Right of Return, no matter who is found to be guilty of it, and no matter which excuse is being used. It’s not as if the existing legal format of the Right of Return has proven to be so successful over the years with all its technical ramifications in place. No matter what anyone says, for the overwhelming majority of Palestinians, the Right of Return is non-negotiable, and untouchable. It surely is not primarily a matter of paperwork, but of conviction, dedication and steadfastness. Unless I misunderstood, I found similar views echoed in a tweet from the non-partisan Gaza Youth Breaks Out: @GazaYBO: “We are all behind President Abbas in the political confrontation with America and Israel.” It should be added, that the very next tweet contained a harsh denunciation of both Hamas and Fatah over their long-standing feuds. Mahmoud Abbas should not expect one day of good talking to undo years of heart-wrenching political blundering, cooperation with IDF armed forces, and oppression of dissidents. I believe that for now, we should stand united in the diplomatic confrontation between the Palestinians on one side, and Israel and the US on the other side. Let supporters cheer if they want to; we, the critics will wait and see. True support needs to be earned, after all. But in the mean time, let it be known to the world that when Palestinians are face to face with their enemy, they are as one. Tariq Shadid over the years, has published various articles of political analysis at the Palestine Chronicle and the Palestine Think Tank. A number of his essays have been bundled in the 358-page paperback ‘Understanding Palestine’, available at Amazon as well as Barnes & Noble.